Two months ago, I saw an intriguing post on the local Madison Area Parents and Community Facebook Page. It was a post shared by Madison resident, Lisa MacNair, that originally came from The Friends of Florham. It read, "Did you know that there are pamphlets and self-guided tour literature in the foyer of the mansion? Visitors can embark on a self-guided tour when they like!" I was curious. Where was this beautiful mansion in the picture, and why hadn't I heard of it? I've lived in Madison for almost 14 years, and feel that I have explored every nook and cranny of the town and surrounding areas. Someplace new to investigate? I'm in! I contacted Lisa to learn more. She is a member of the Friends of Florham, which was first organized by volunteers in 1990 to help preserve the historic elements of Fairleigh Dickinson University Florham Campus. Lisa kindly offered to give me a personal tour of Florham, and also included an FDU junior, Sarah, who volunteers with the Friends of Florham and helps in marketing it. I loved how the organization includes current FDU students, which not only helps the students gain real-world experience and an appreciation for the history of their campus, but also brings in a younger generation who brings new ideas to the group and will continue with the mission of preservation. I soon learned that Florham is the former spring and autumn country estate of Florence Vanderbilt (granddaughter of Commodore Cornelius Vanderbilt, who was at one point the richest man in America), and financier Hamilton McKown Twombly. The couple combined their two first names to create the estate's name. (Now you can wow your local friends at the next dinner party with that fun fact!) They purchased the property along what was then known as "Millionaire's Row" (1,200 acres in all) in 1890, and, in 1897, completed the 100-room Georgian revival mansion that was designed by the noted architectural firm McKim, Mead, & White (who designed New York's former Pennsylvania Station and Columbia University, and other iconic buildings). We started our tour of Florham through the center doors, and into the Great Hall. The floor was a beautiful white and black marble design, and the walls were filled with photographs of when the Twomblys lived there. In the photos, you can see that originally the walls were lined with tapestries and busts of Roman emperors on pedestals. To the left, we explored the former sitting room (now lecture and event hall) and peeked into the former kitchen, pantry, and linen room. Though they are now used as university offices, the added dividing walls maintain the architectural integrity of the rooms. Next, we spent some time in Lenfell Hall, the former drawing room that is currently used for banquets, weddings, and other large events. The original and reproduced portraits along the walls, gathered through a special facet of the Friends of Florham, tell the Vanderbilt/Twombly family story. Starting with grandfather Cornelius Vanderbilt (born in 1794), they continue all the way through the family tree to the couple's grandson and his wife, who passed away in the 1980s. One blank space is "reserved," with the hopes that they will get permission to reproduce an 1890 portrait of Florence by John Singer Sargent. Family portraits continue just outside the room in the Great Hall, alongside a painting of Frederick Law Olmsted, landscape architect of Florham (who also designed Central Park in New York City). Through the doors of Lenfell Hall takes you to the beautiful Italian gardens and back veranda. This land (more than 900 acres) was developed by Hamilton Twombly as a working farm where he raised dairy cattle. After the death or Florence and her daughter Ruth in the early 1950s, this land was sold to Exxon, and was later developed into a corporate park. If you look hard, you can see the Jets training facility through the trees. Back inside and up the grand staircase, we explored a few more rooms, including Florence Vanderbilt Twombly's bedroom, which is now filled with student desks and fitted with a projector in the ceiling. Her dressing room, with the built-in drawers and cabinets, is now used as a professor's office. It made me smile to think that these students are having lectures in Florence's former bedroom and meeting with professors in her dressing room. In addition to the well-maintained beauty of the building, one of my favorite things was seeing that it remains an active and lively part of the FDU campus, filled with students, professors, and administration, including the President's office. All students have at least one class in the building, which I think helps them appreciate to history of their campus. I also enjoyed hearing about how the Friends of Florham is bringing the local community of all ages in to appreciate the mansion. They often hold lectures and other events. On April 29 at 1pm, there will be a presentation of the gardens and landscape of the estate called "Sculpting the Land: Creating Gilded Age Gardens." ($20 admission; for more information or to purchase tickets, click here.) 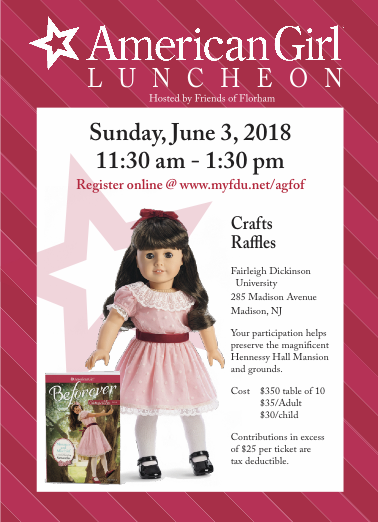 On Sunday, June 3, from 11:30am-1:30pm, they will hold an adorable American Girl themed luncheon. (Information will be posted here soon.) These are just two examples of how Friends of Florham is making the beautiful mansion accessible to multiple generations. Lisa let me know that they are happy to give tours to help others learn about Florham. She even suggested combining it with an afternoon tea at the Cozy Cupboard just up the road for a nice afternoon out with friends. I can picture Florence Vanderbilt Twombly doing just that--enjoying her afternoon tea while entertaining friends on the veranda of her beautiful Florham estate on a warm spring afternoon. Also, check out the self-guided-audio tour, the Treasures of New Jersey segment from NJTV, and the interactive timeline of Florham campus history. Spring is on Sabbatical: Now What?